2) Hijo del Rambo & Rambo Jr. b Hijo de Máscara Sagrada & Rolling Boy Jr.
Hija de Karonte appeared to challenge Keira after the match. Macizos get the win. Pequeno Ciclope did a dive off the entrance set. After the match, Ciclope threw down his DTU Alto Rendimíento title for lack of quality challengers and demanded a shot at the main DTU title. Shiryu & Rebelde bled. Pesdailla, not originally listed in the match, beat Super Mega to win the title. Ciclope challenged him to a title match. Drastick did the required dive off a light standard on Eita & Eterno. Ricochet beat Flamita for the win with a shooting star press. 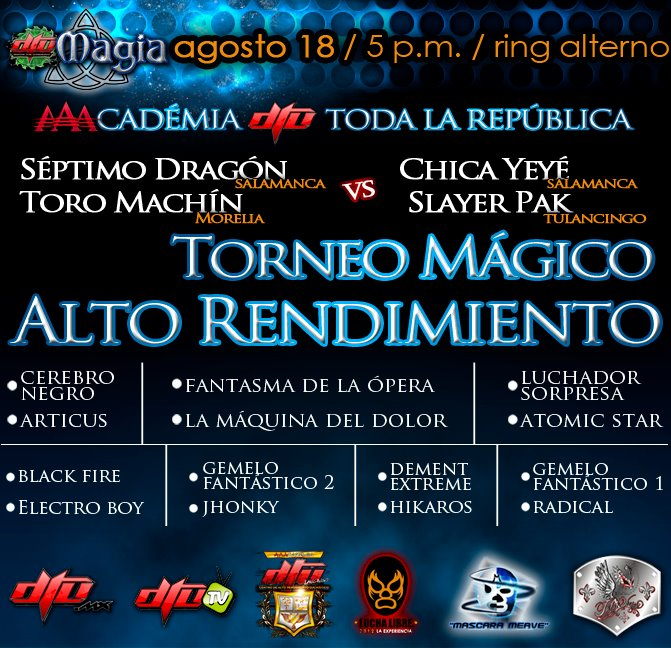 Champion Mr. Aguilita "is going thru a bad time", so Freelance took his place in the usual PdM minis match. Seminarista is probably Skayde. Daga's team controlled the match, but Juvi pinned him. Daga and Juvi challenged each other post match. Jack pinned Lider for the win after Psicosis fouled him. This might have been for the PdM Extremo title; same group of guys. Garza's team tried to jump the Perros, only for the Perros to still get the drop on him. Perros took the first, handicuffing the other team. Park's team took the second, breaking out of the handicuffs. In the grand tradition of Perros del Mal shows, this ended without a finish. Los Bizzaros - as Los Secta Bizarra (Ciber, Taboo, Billy, Cuervo, and apparent new recruits Espiritu and Mini Charly Manson) ran in to attack Los Perros. More Perros ran out, and the two sides fought thru the arena and the rest of expo. A glass class around a fire extinguisher was broken. Security eventually broke the fight up. 1) Guardián De Acero, Guerrero Del Sur, Pequeño Fénix, Relámpago Veloz b Blacky, Likano, Rinoceronte, Rinoceronte Jr.
R de Rudo recap says Sahori is back from an international tour. Xtreme Mysterio is Gerardo Rodriguez, 31, 8 years a wrestler. match quite changed. 5 v 4 for no reason. Tecnicos all got pinfalls for the win. 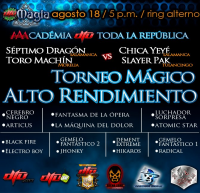 2) La Hielera & Pantera (indy) vs ? & ?? Tecnicos took 2/3. Calo looked nervous early, got better as the match went on. Oriental was the best guy on his team. 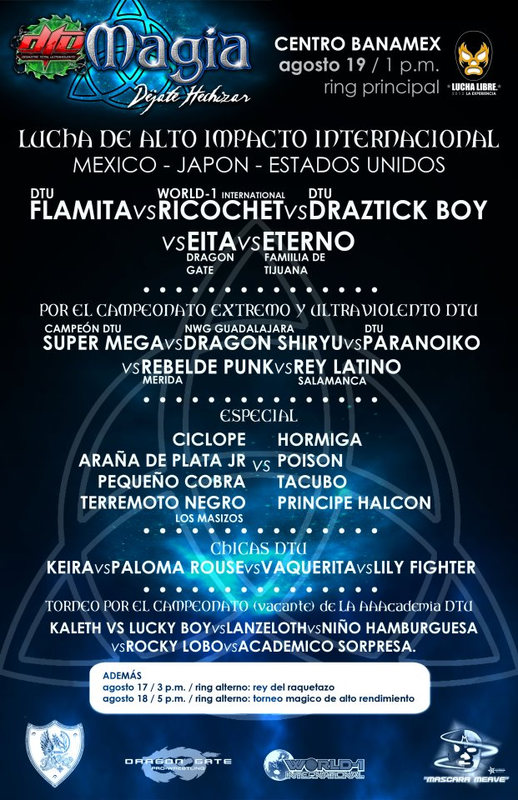 4) Axel, Huracán Ramírez Jr., Tinieblas Jr. DQ El Hijo del Medico Asesino, Pirata Morgan, Scorpió Jr.
Medico replaced Hijo del Lizmark, and might be getting a big emphsas in this group. He feuded with Axel while Tinieblas and Pirata Morgan did the same. Pirata pulled Tinieblas' mask and rolled him up for the win, but the referee figured it out later and called for the DQ. Medico unmasked Axel after the match. straight falls, Epitafio's team cheating to win. Navarro's team took 2/3 to keep the titles. Event Notes: A cibernetico for the vacant AULL Lightweight Championship was scheduled apparently didn't take place.